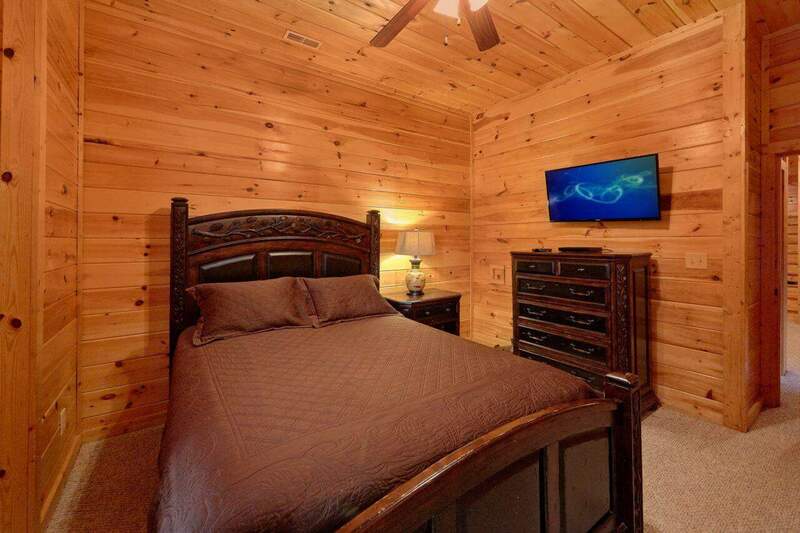 You won't have a moment's regret when you book Misty Mountain Lodge. 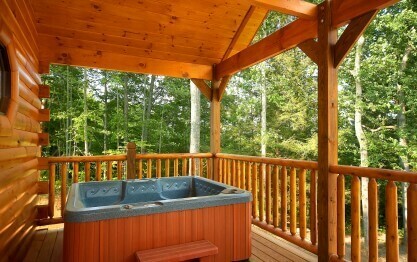 It's perfect for large groups and reunions or for a family who wants to experience the smokies and enjoy the good life. 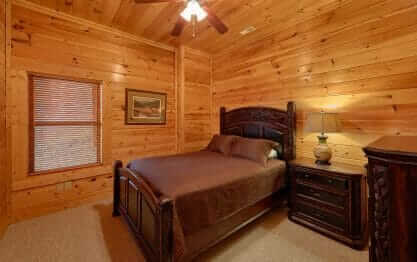 This professionally decorated luxury Log Cabin sleeps up to 14 and is perfect for all occasions. 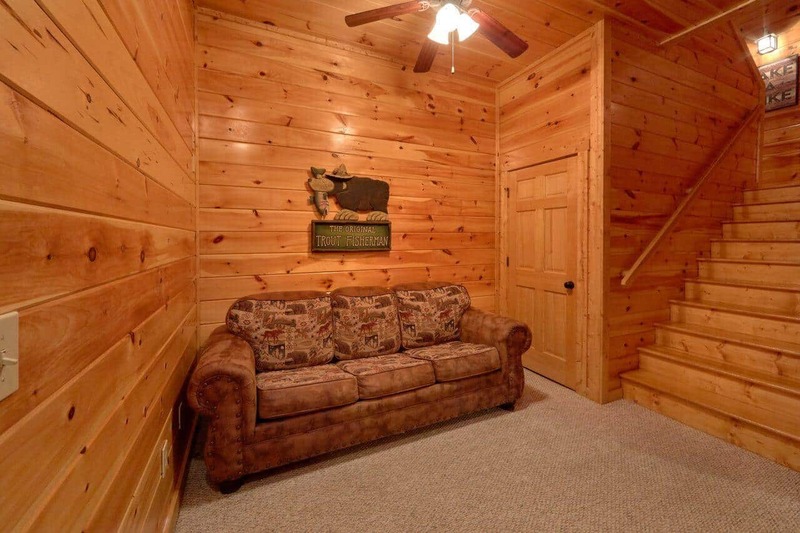 This 5 bedroom Gatlinburg rental is a comfortable and upgraded cabin close to downtown Gatlinburg and the Smoky Mountains main park entrance. 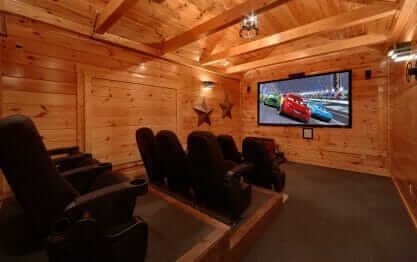 Enjoy your private home theater room with a 9' theater screen and surround sound in this luxury Gatlinburg cabin rental. 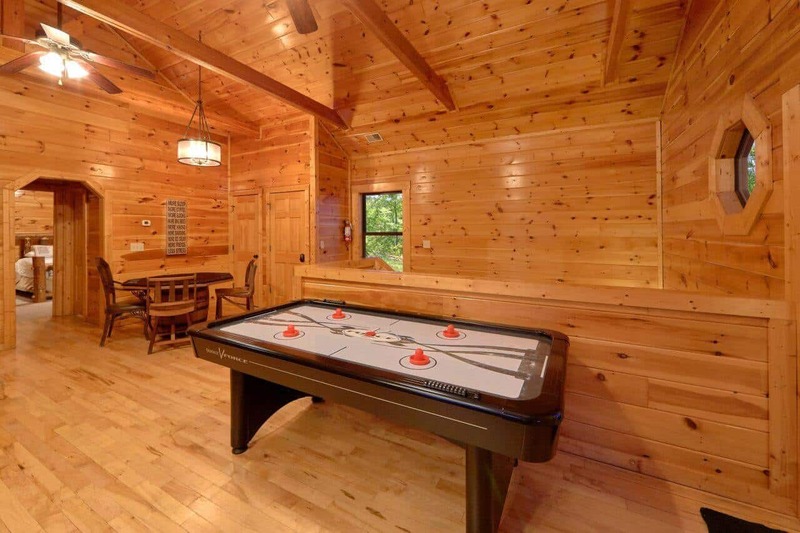 Or, play a game of pool, cards or air hockey after grilling on the deck. 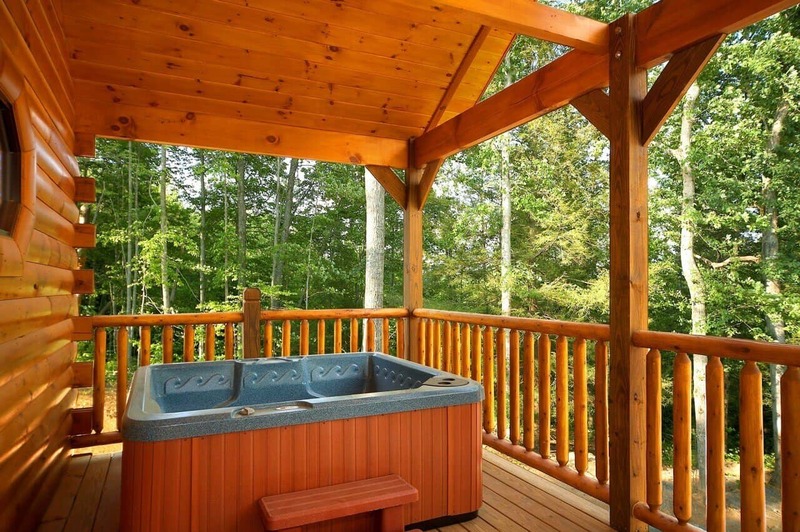 Located on a covered deck, the hot tub and rocking chairs are perfect solutions for unwinding. 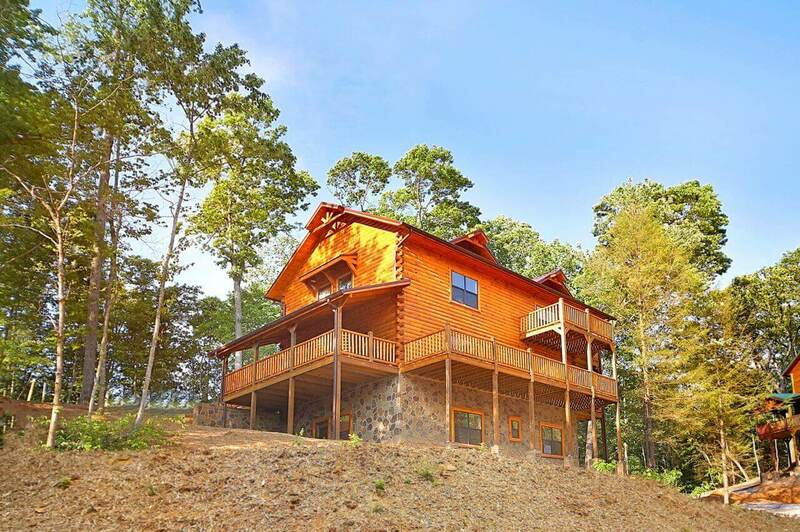 Misty Mountain Lodge features 5 bedrooms and 4 full baths. Two of the bedrooms have king beds, two bedrooms have a queen bed and there is a queen over queen bunk bedroom included, too. 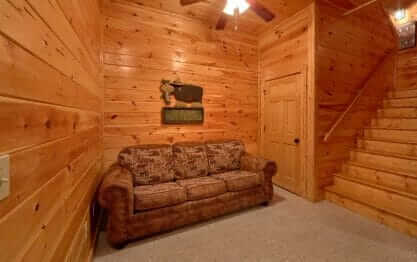 There is a comfortable sleeper sofa tucked away in the lower level sitting area with TV and DVD for extra guests. You can count on a large fully equipped kitchen including coffee maker, blender, mixer and complete cooking and serving ware. The picnic style rustic aspen and cedar dining table is large and there are 3 upgraded bar seats at the kitchen bar. 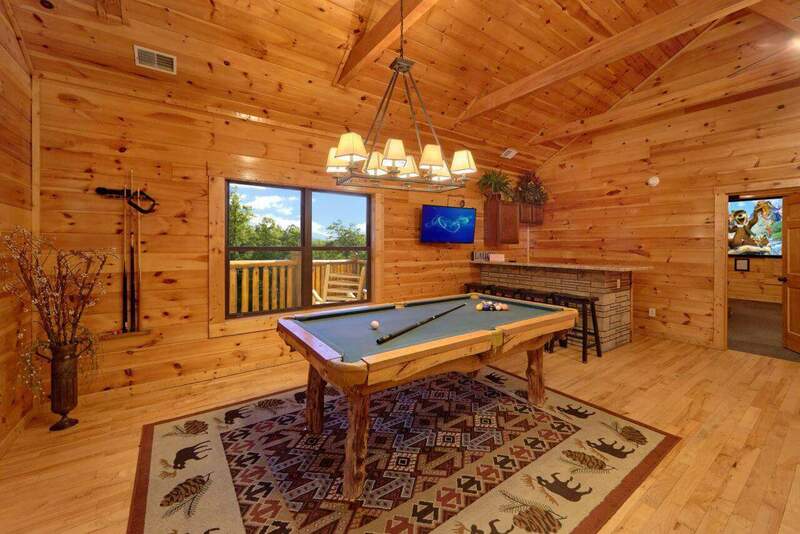 Whether you are on the deck soaking in the surroundings, sitting on the leather sectional in the open main area or having a meal with friends and family, the space and grandeur of Misty Mountain Lodge will surely make you smile. "Another Wonderful Family Vacation in Gatlinburg"
Our third visit to Gatlinburg, we love the peaceful surroundings and yet so much to do and see. Thank you for your wonderful review, Chris! We are delighted to hear your stay was exceptional. We enjoyed having you as our guest and hope you and your family will stay with us again in the future. We encourage guests to book direct and save up to 15% on your booking. "The Greatest Family Trip "
It was literally amazing!! We had so much fun and the kids loved the cabin more than us. Thank you for your wonderful 5 Star review, Ashley! We are delighted to hear you and your family enjoyed your stay. 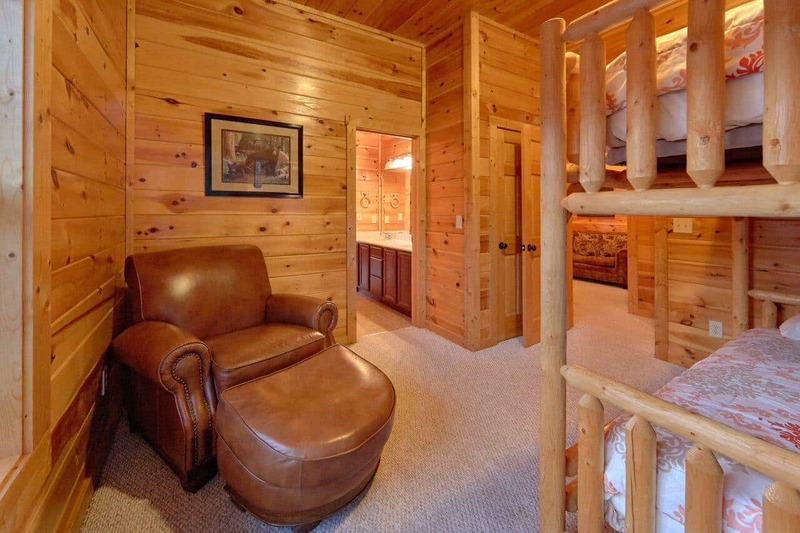 You certainly chose the perfect cabin to make lasting family memories! We enjoyed having you as our guest and hope you will consider staying with us again in the future. We encourage guests to book direct and save up to 15% on your booking. Thank you for your kind review, Kimberly! We are pleased to hear you enjoyed your stay. 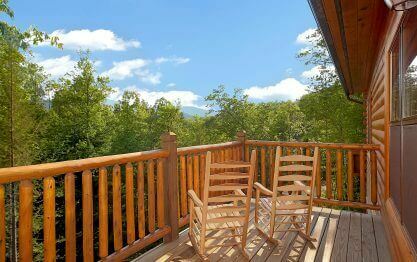 We hope you will consider staying with us again during your next visit to The Great Smoky Mountains. "Family’s Christmas Get Together "
We loved the house! This house had plenty of room, very clean and we loved the location! We will go again! We are delighted to hear your family's gathering was such a success, Jody! 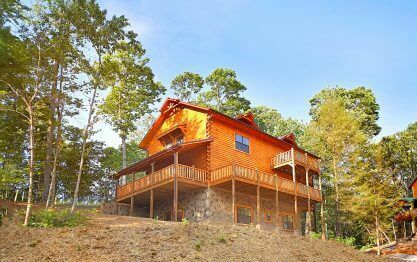 It sounds like you chose the perfect cabin for you and your family to relax and create memories that will last a lifetime. 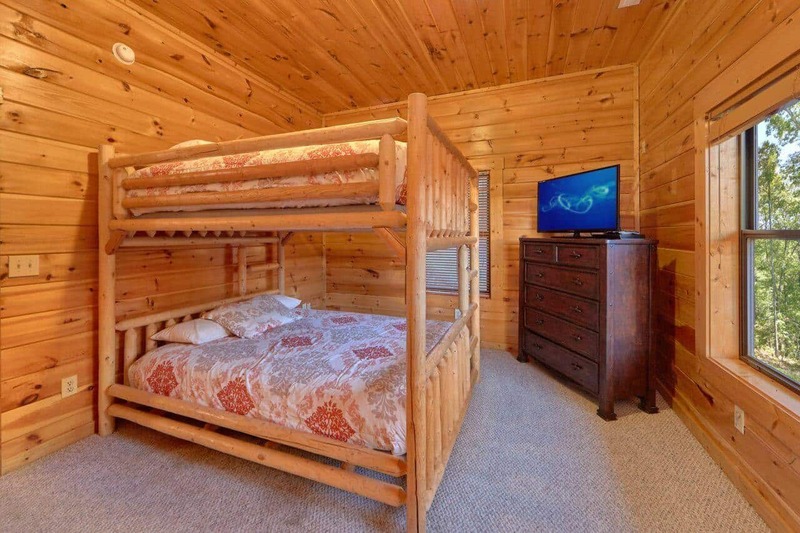 Misty Mountain Lodge is a great cabin, and it's full of top-notch amenities for the entire family to enjoy throughout their visit. 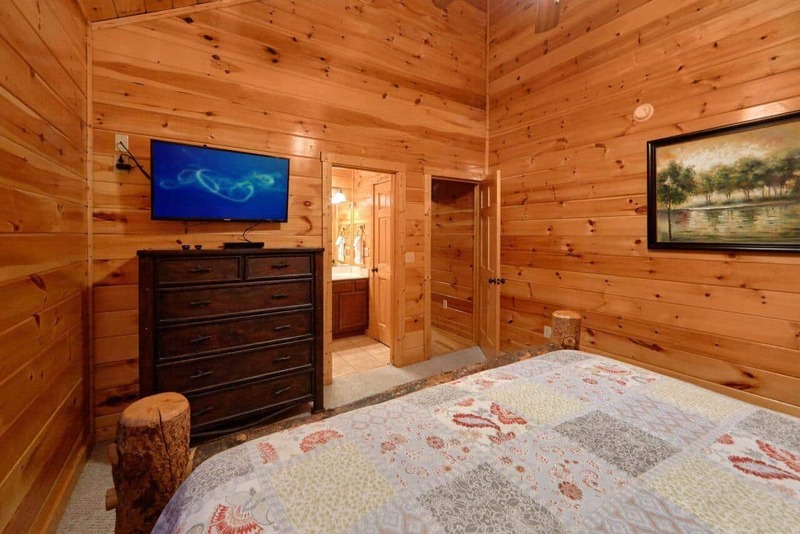 Also, as you mentioned, the location is perfect for for accessing downtown Gatlinburg or The Great Smoky Mountains National Park and still feeling tucked away on the mountainside. We hope you and your family will make plans to visit with us again very soon! Please keep in mind, as repeat visitors you will enjoy 10% off all future bookings. Hurry back, new memories are waiting to be made! 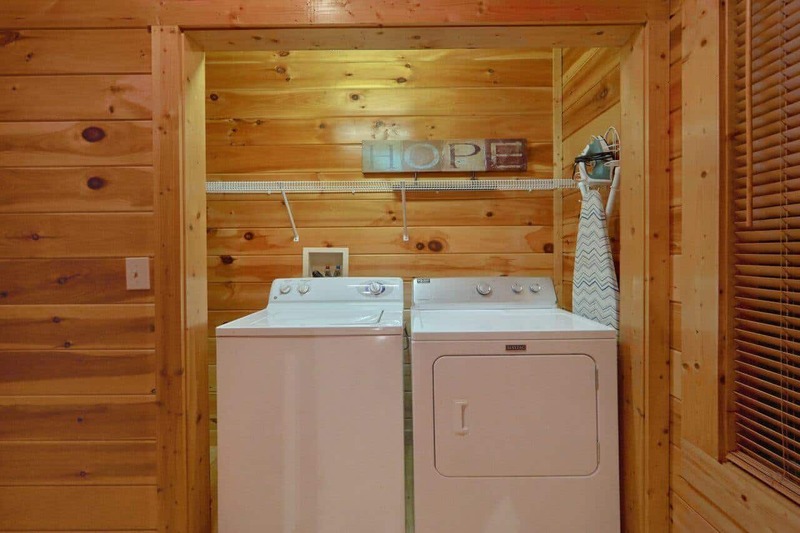 I couldn’t believe the cabin looks just like the picture. I really enjoyed my stay. The cabin was clean and the beds were very comfortable. It had all the pots and pans needed for cooking and e…veryone was able to spread out and just be alone or could come together in one room. I would stay again! Thank you for your fantastic 5-star review, Cynthia! You certainly chose a great cabin to relax and enjoy some time away from the hustle and bustle of everyday life. 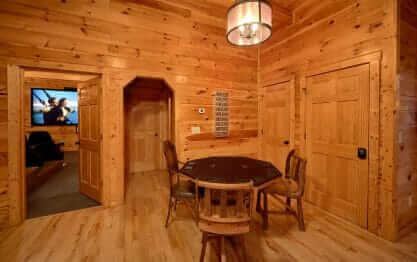 Misty Mountain Lodge is a perfect cabin full of top-notch amenities for everyone to enjoy throughout their visit. 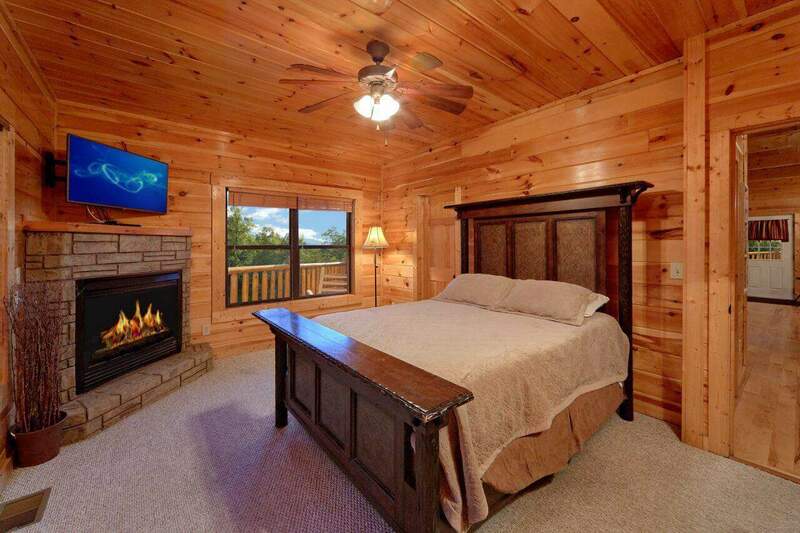 It would be our pleasure to serve you again on your next trip to The Great Smoky Mountains! Please keep in mind, as repeat visitors you will enjoy 10% off all future bookings. Hurry back, a new adventure awaits! 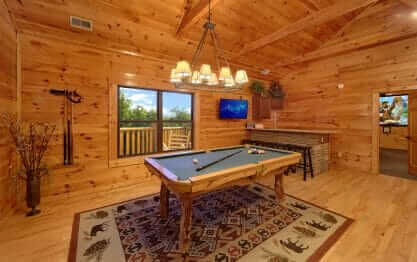 The cabin is AMAZING!!! The location was great, they had everything we needed, the only thing we would change is that we would stay longer! Definitely recommend this place and we will stay here again!! Thank you for your fantastic review, Karen! We certainly agree. 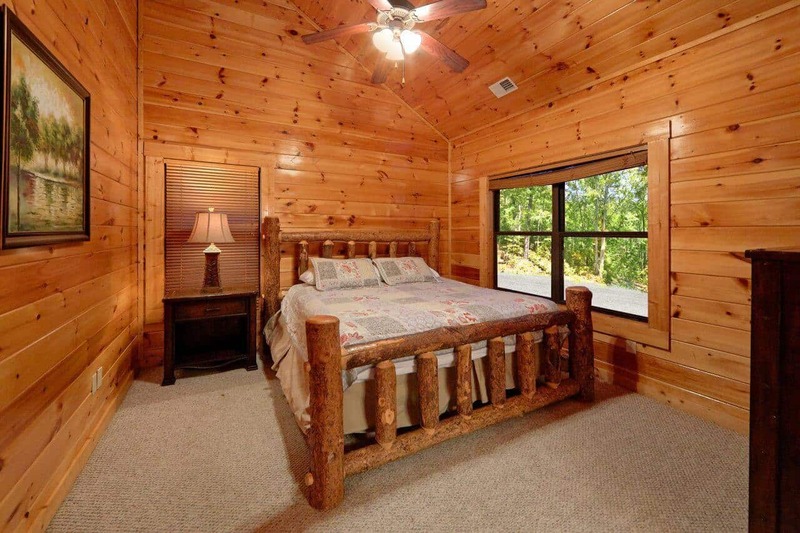 Misty Mountain Lodge is a wonderful cabin, and is perfect for enjoying some time away from the hustle and bustle of everyday life. We truly hope you will make plans to visit with as again very soon and for your next visit may be you can stay longer. Please don't forget to mention you are a repeat visitor to enjoy 10% off all future bookings. Hurry back, new memories are waiting to be made! Thank you for your kind review, Diana. We are pleased to hear you enjoyed your recent cabin stay. It would be our pleasure to serve you again in the near future. Our group of 4 couples had an amazing time. The cabin was clean and comfortable. Great space for a group of couples like ours or a few families. We liked that the cabin is only 10 minutes from downto…wn Gatlingburg so we could join all the fun things to do in town or relax in the peace and quiet of the cabin. This was our first time renting a cabin and we were happy with how easy the entire experience was from reservation, to checking in and checking out. We certainly hope to return again. Thank you for an amazing week. Thank you for allowing us to be a part of your successful retreat, Wendy! It is a pleasure to hear that everyone had such a great stay at Misty Mountain Lodge. We certainly agree! 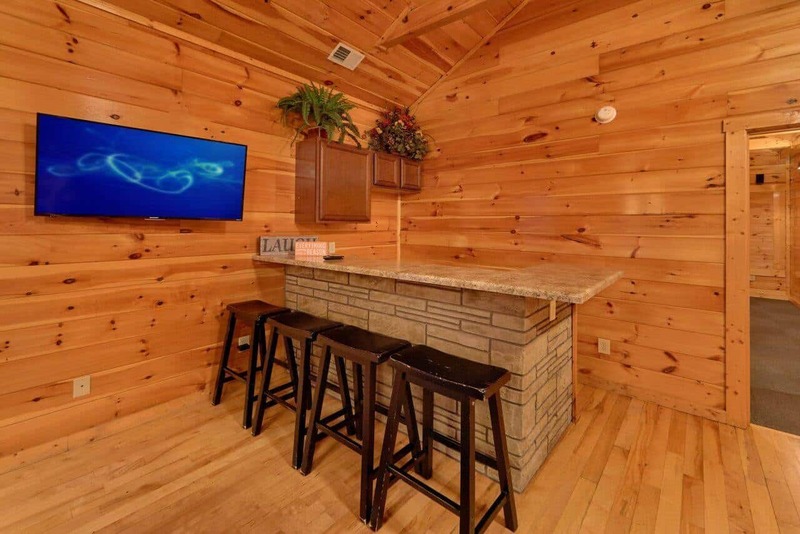 The cabin is in a great location to relax and unwind or hit downtown Gatlinburg for some fun and shopping. It was our pleasure to provide you with a luxury getaway, and we truly hope you will plan another visit soon. Please keep in mind, as repeat visitors you will enjoy 10% off all future bookings. Hurry back, new memories are waiting to be made! I was surprised that once we arrived at our cabin that it looked exactly the way the online pictures did. It was a very good first time experience my family and I are looking forward to coming back. Attiyah, thank you so much for your wonderful review. We do our best to keep our cabin photos and descriptions on our website up to date so you know exactly what to expect upon arrival at your cabin. As a first time renter, we are pleased that everything was to your satisfaction. When you are ready to book your return trip, please be sure to let us know you have stayed with us in the past and take advantage of your 10% discount! I was hoping to have the opportunity to thank ELK Springs for the amazing time we had at the cabin. 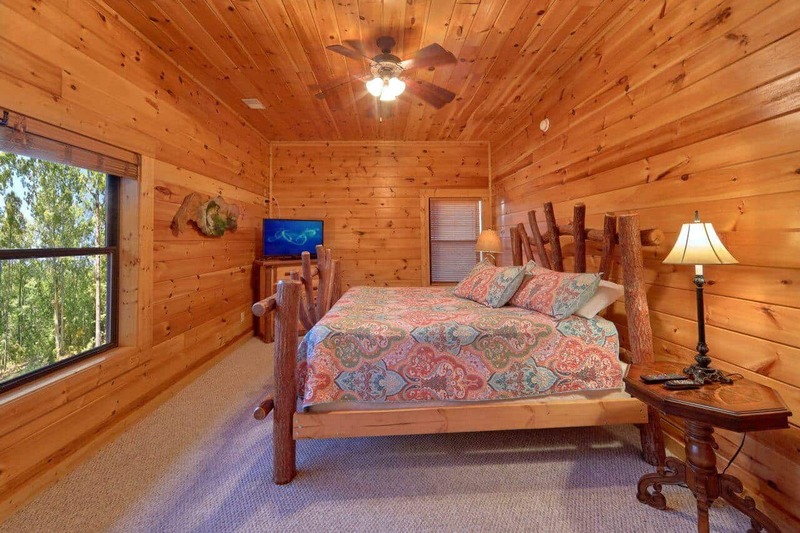 The truth is that the pictures do not do your cabin justice! It was better than any of us expected, …and trust me, when you have kids from 1 to 15, and grandparents on top of that, the expectations are high :) Everyone found things to do and enjoyed the place to the fullest! We had everything we needed and the place was clean and WARM (we got there at night and we were afraid we were going to freeze for the first hours, but that was not the case!). Again, THANK YOU! We are already planning the next mini vacation! Thank you for sharing your experience with us, Ana. It was our pleasure to provide you and your family with luxury accommodations. 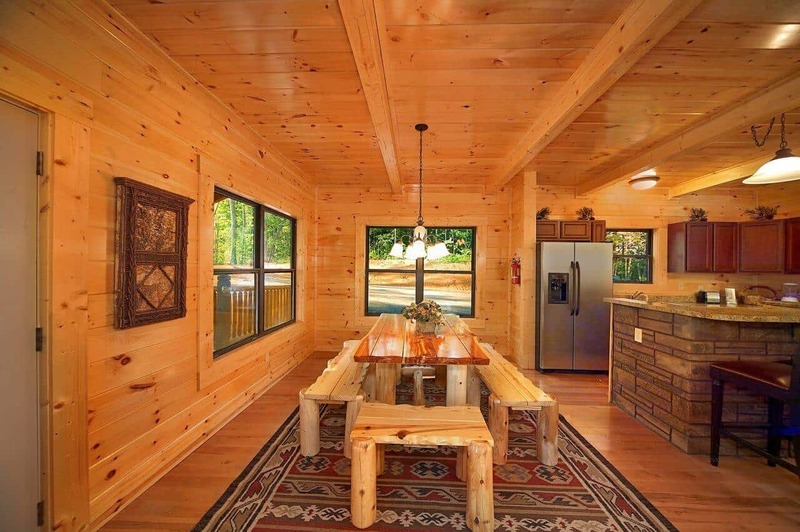 It sounds like you chose the perfect cabin to relax and create lasting memories together. 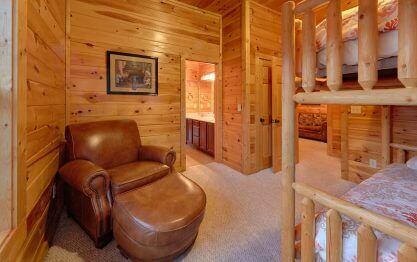 Misty Mountain Lodge is definitely full of top-notch amenities for the entire family to enjoy! We can't wait for you to visit again. Don't forget to mention that you are repeat visitors to receive an additional 10% off all future bookings! Hurry back, new memories are waiting to be made. Our group, 14 in total, had a great time at the Misty Mountain Lodge Cabin. Is big enough for a group of this size. The cabin was beautiful. We had a wonderful experience and plan on booking a cabin in the future. Thank you for your fantastic 5 star review, Carlos. We are delighted to have been a part of your successful retreat. 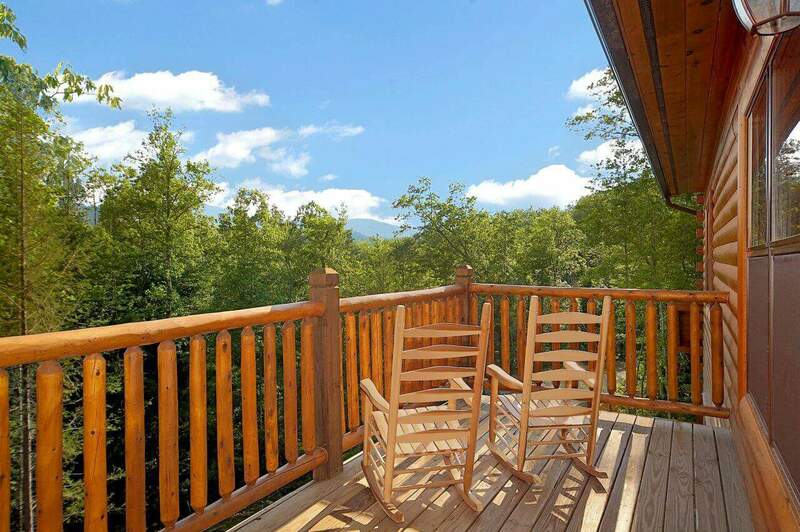 Misty Mountain Lodge is in a great location only moments from downtown Gatlinburg and perfect for larger groups who like to explore the area. We look forward to serving you again in the future. Please keep in mind, as repeat customers you will enjoy 10% off all future bookings. Hurry back, new adventure awaits! "Our Stay At Misty Mountain Lodge "
Our stay at Misty Mountain Lodge was more than what we expected. The cabin was beautiful and well kept. It was everything the pics shown it would be. We can?t wait to come back and stay longer the next time! We wasn?t ready to leave. We are happy to hear you enjoyed your stay, Loukisha. 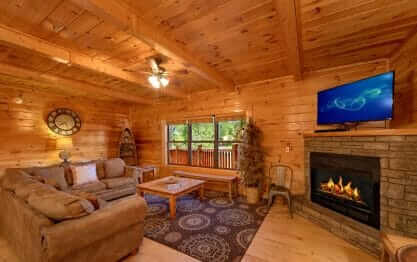 Misty Mountain Lodge is an exceptional cabin with top-notch amenities to enjoy throughout your stay. 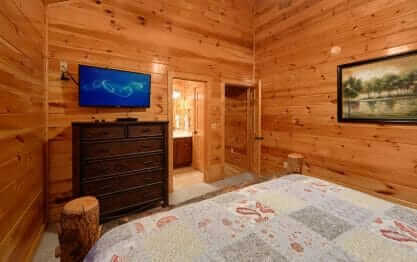 The pictures and description on our website are a true reflection of what you will find when you arrive at the cabin. We are happy you enjoyed your visit and look forward to your next visit with us! Thank you for your wonderful review, Jitendra! We are pleased that you enjoyed your cabin stay. We hope that you will join us again during your next trip to The Great Smoky Mountains. Please keep in mind, as a returning guest you will enjoy 10% off all future bookings! This cabin was beautiful. It had a homey feeing to it. Was well maintained. We will be coming back in the future. Thank you for your kind review, JC. We are delighted that you enjoyed your cabin stay! We truly hope to become your home away from home while visiting our area. Keep in mind, as a repeat guest you will enjoy 10% off all future bookings! We absolutely loved this cabin. I would highly recommend this to friends and family. Misty Mountain Lodge is in a perfect location not too far from fun activities and is within 4 miles from a 24 hour …grocery store. Thanks again for a great stay! Will for sure be back again! Thank you for your wonderful 5 star review, Diana. 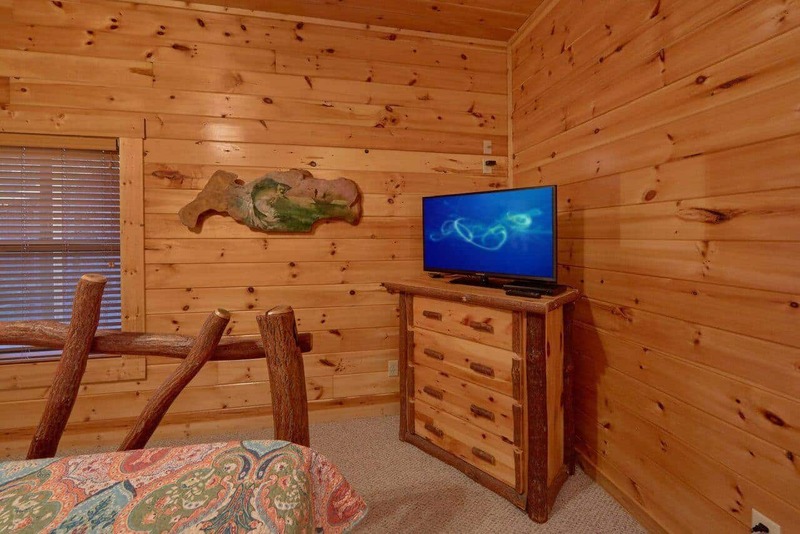 It sounds like you chose the perfect cabin for a fun getaway. We hope you will join us again during your next trip to The Great Smoky Mountains. Hurry back, new adventure awaits! Very relaxing and fun! We would stay at the same cabin again. From sitting in the rocking chairs and enjoying the view to playing games in the game room best weekend trip in years! Our cabin was more than spacious for our 3 families. This was a beautiful cabin. The kids really enjoyed all the activities including the movie theater, pool table, air hockey, and hot tub. The cabin was very clean and beautiful. We will definitely come back!!! Thank you for choosing Elk Springs Resort as your family's vacation destination, Steven. We are delighted to hear your stay was exceptional. 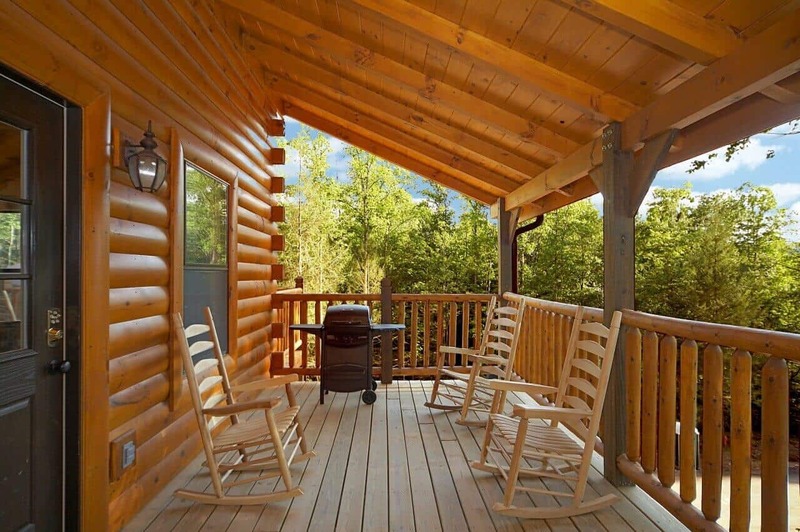 We take pride in offering luxury, family-friendly cabins that each and every member of your family will enjoy to the fullest! We enjoyed having you as our guest and would consider it an honor for you to stay with us again. Please keep in mind, as a returning guest you will enjoy 10% off all future stays. Hurry back, new memories are waiting to be made! "Amazing Cabin for Large Group"
Thank you for allowing us to be a part of your successful retreat, Kristin! 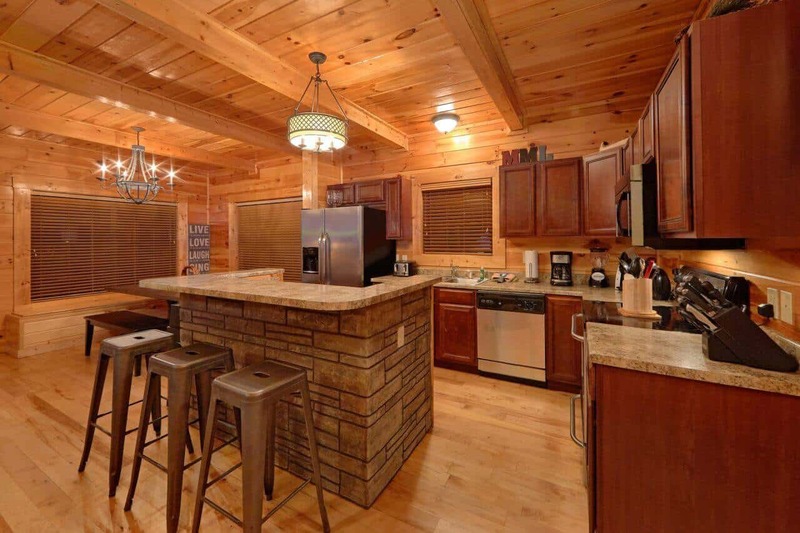 We certainly agree, Misty Mountain Lodge is the perfect cabin for larger groups to gather and enjoy quality time together. We enjoyed having you as our guest and hope you will consider staying with us again during your next visit to Gatlinburg. "Great stay for 3 years in a row." We rented Misty Mountain and Serenity Lodge. Always a great stay. Thank you for your wonderful review, Fiechia! We love our returning guests! We enjoyed having you as our guest and hope you will consider making us part of your annual event. We hope to see you again soon! ""An Absolutely Gorgeous Place to Stay!!"" This place gets two thumbs up from my family! From the moment we arrived, until the time we left, we had an awesome time. The cabin was spacious, clean, and overall comfortable. Maintenance was a call… away when we needed trashed picked up, as well. It was certainly our "home away from home"!! We will definitely be returning! Thank you for the wonderful review. We are so happy you picked Elk Springs Resort for you "home away from home"! Please come visit us again and enjoy our beautiful Smoky Mountains! My experience was exceptional. 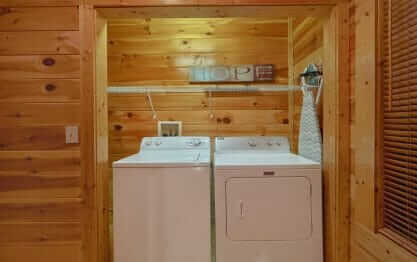 The cabin is spacious with lots of amenities. We had an awesome vacation & I intend to visit again soon. Also, I will recommend Elk's Spring Resort to everyone I know. Thanks guys. We are excited to hear we exceeded your expectations, Tomeka! We would consider it an honor for you to come back and stay with us again. Please keep in mind, as a returning guest you will enjoy 10% off all future stays. Hurry back, new memories are waiting to be made! This Cabin was amazing. We had a great time. There was so much to do, and not enough time to do them all. We will be coming back to this cabin. Thank you so much for your review Terry. We do hope that your will come back and enjoy all that the Great Smoky Mountains and Elks Springs Resort has to offer. Thank you for your wonderful review, Debrann! We love receiving stories such as yours. We enjoyed having you as our guest and hope you will consider making Elk Springs Resort part of a new tradition when visiting Gatlinburg. "Really great getaway with special friends." Elk Springs was a fantastic way for our group of 5 couples to spend a couple days together in one beautiful lodge. Everyone had nothing but positive comments about our yearly getaway. Thank you for allowing us to be a part of such a wonderful get-away, Phil! We hope you will make consider making Elk Springs Resort part of your annual friend's retreat. Please keep in mind, as a returning guest you will enjoy 10% off all future stays. Hurry back, your next Smoky Mountain adventure awaits! "Perfect stay for our family. " This cabin was perfect for our family. We loved the location, the cleanliness and the theater room. It was a very nice cabin and we enjoyed our stay. Thank you for your kind review, Robert! We are happy to hear your stay was exceptional. We enjoyed having you as our guest and hope you will make plans to stay with us again! Couldn't have asked for nicer accommodations-we had everything here. We are happy to hear Misty Mountain Lodge exceeded your expectations, Bonnie! We hope you will make plans to come back and stay with us as often as your schedule allows. Hurry back, your next adventure awaits! Thank you for allowing us to be a part of such a wonderful celebration, Ashley! Congratulations! We are happy to hear the cabin exceeded your expectations. We would love for you to make Elk Springs Resort an annual tradition. Please keep in mind, as a returning guest you will enjoy 10% off all future stays. We look forward to seeing you again! We are so happy you enjoyed your stay last April! We hope that you will visit us again this Spring or Summer! Give us a call and get booked! The mountains are calling! Thank you for the 5-star review, Travis. 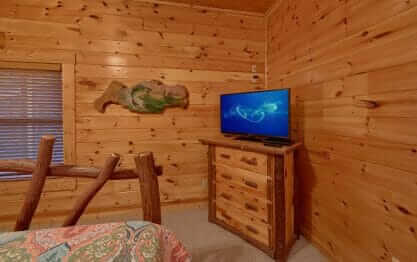 Misty Mountain Lodge is well liked by our guests for the great amenities it offers. The theater and spacious game room make for a great place to spend a relaxing weekend with family and friends. We hope your positive cabin experience will make you a return guest to Elk Springs Resort in the future! "It was a great vacation"
I had a great time, and all my questions were answered quick and efficiently. The house was very big, clean and beautiful. I would take another 12 hour drive just to do it again. We appreciate your business and your wonderful 5 star review, Dante! We are delighted to hear that you enjoyed your stay at the Misty Mountain Lodge. We would consider it an honor if you would join us again. Please keep in mind, as a returning guest you will enjoy 10% off all future stays! 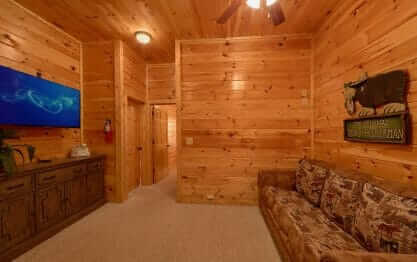 "The cabin is clean and well-equipped"
The cabin is very comfortable and well-equipped. We had a great experience in Gatlinburg. Thank you for your kind review. We are pleased to hear that you had a very positive cabin rental experience. We certainly hope you will come back and stay with us again. All of our guests receive a 10% discount off all future stays! This was one of four cabins we rented. Absolutely gorgeous. It met and even exceeded our expectations. Thank you once again for a 5-star review and letting us know that your stay exceeded your expectations. Bring your whole family back year after year and continue the tradition! "Most Beautiful Wedding Spot in Gatlinburg!" We rented Southern Philosophy, Misty Mountain Lodge and Summit Sanctuary for our wedding ceremony and reception. All of our guests said it was the most beautiful wedding that they ever attended! T…he staff was very accommodating and helpful, offering their assistance with any last minute needs! We could not have asked for a better location! The property was perfect for a 40 x 20' tent and our 85 guests! Mist Mountain Lodge was used by the groom's family, which was perfect for 6 children and and 8 adults!! Everyone had an excellent weekend! 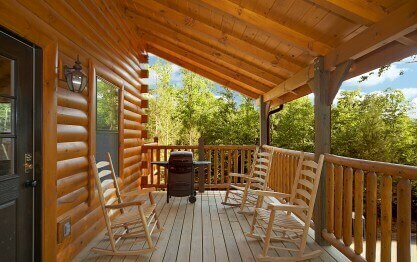 We rented the three cabins for our famiies and close friends to stay for the weekend, which was close to 40 people! . Everyone had a wonderful time during their stay, not only enjoying the ceremony but all the offerings of the cabins! From pool tables and theater rooms to saunas and hot tubs, Elk Springs Resort is top notch! No comparison to other rentals in the area! If you're looking for a fun, relaxing weekend away, or an excellent spot for a moderate sized wedding, you've found it! Thanks to all of the staff for making our special day better than imagined! "A Last Minute Catastrophe Turned Magnificent - Thanks Elk Springs!" We made the mistake of booking a trip to Gatlinburg with a competitor of Elk Springs, and we experienced nothing but regret from the time we got into town. After nearly 5 hours of dealing with the oth…er company and their excuses, we decided to call Elk Springs, not expecting them to have anything available. My family and I were blown away at the professional, friendly, courteous, and accommodating staff we encountered. They made sure to follow up anytime we had a request. They even followed up after the trip. They went above and beyond to make sure everything was perfect, and we loved staying in the beautiful, extremely clean and comfortable Misty Mountain Lodge. We will use Elk Springs again and again as we travel to Gatlinburg! Thank you again for all of your help! We had a great weekend down in Gatlinburg staying at Misty Mountain Lodge! The cabin was big, clean, and comfortable. Couldn't find a better place for the price we paid. The cabin was far beyond our expectations. It looked exactly like the pictures we were shown prior to arriving. My friends and I had a great and memorable weekend. We will definitely be back before the end of the year! It was our family's first time to spend Christmas away from home. It was wonderful! So restful. Our cabin was beautiful and met our every need and want. So looking forward to a return trip in the future! Our stay at Misty Mountain Lodge was very enjoyable. We had lots of room and everything was comfortable. We liked the location as it was easy to get to and close to lots of things. The unit was ver…y clean and well maintained. Our only issue was no potholders to handle cooking and no pot scrubbers to clean pans. Things we did not think to bring with us! 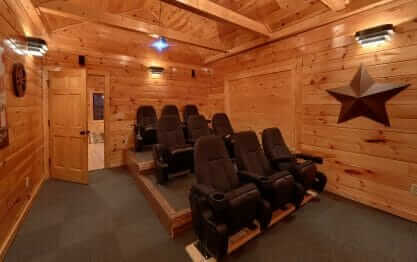 We would have liked to have cable TV in the theater room but managed with renting a movie. Over all we liked our stay and would recommend Elk Springs Resort. Our family visited for a weekend in November and really enjoyed the cabin and Gatlinburg. 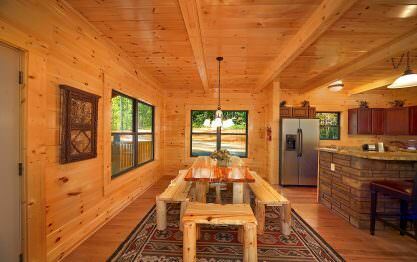 The cabin was perfect with plenty of room for everyone to have their own space. We are already discussing a longer stay next year at the same resort. Took the ladies of the family down for a weekend. All in all, a great experience. My family loved this location. The cabin was roomy and comfortable. They had everything we could think of needing (including a Kcup!). The place was clean and the views were beautiful. "Beautiful Place to Stay in the Smoky Mountains"
We were absolutely thrilled with this cabin. It was very large--could have slept nearly 20 people, I swear! It was also beautiful--3 floors of knotty pine amazing game room on the 3rd floor with a mo…vie theater (!!! ), pool, air hockey. Kids loved it. They also had a big outdoor jacuzzi. The location was great--about 10 minutes into Gatlinburg. The rental company was also so great. I called for a last minute weekend rental on the way down...they emailed me properties, booked me over the phone, and called to make sure we had good directions to get there. They even called the next morning to make sure we'd gotten in. I will definitely be back. 2 nights were not nearly enough time to explore all that Gatlinburg has to offer. The Misty Mountain Lodge was AWESOME!! There was tons of room for everyone to have their own space including up in th…e game room. 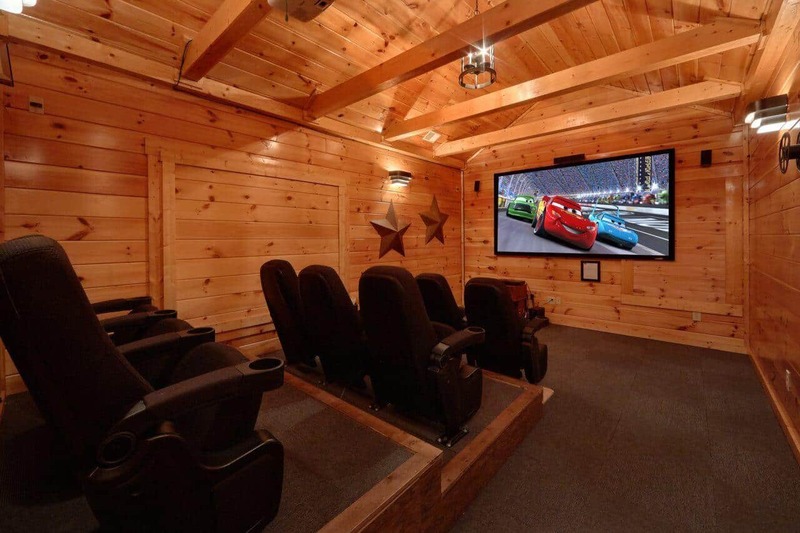 The movie theatre room was a great treat for the kids to enjoy their favorite movies. What a great trip, we'll be looking to book another trip next year! The cabin was beautiful and just perfect for our girl's weekend! We loved the cabin and the area. Will definitely be back!! 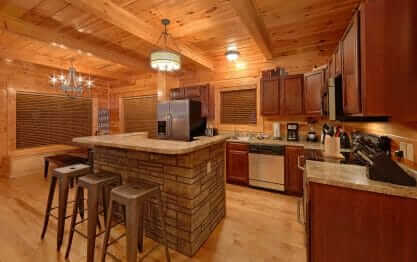 The Cabin was great, the location was perfect, nice amenities, just very enjoyable! We will be back to Elk Springs! Best properties in Tennessee! Wonderful accommodations! We had a great time and would definitely book again! Thanks so much! "More than expected, simply great!!!!" Our short but most needed stay was very relaxing, easy to find, met all our expectations, accomodating for sure, neat and very clean, well thought out with everything you need. Already planning for the next trip. Could not have had a better long weekend if we had scripted it ourselves.There were four couples and we all LOVED Misty Mountain! Even the weather and leaves were perfect (ok, I do know you can't rea…lly take credit for that), but we would return again and again. 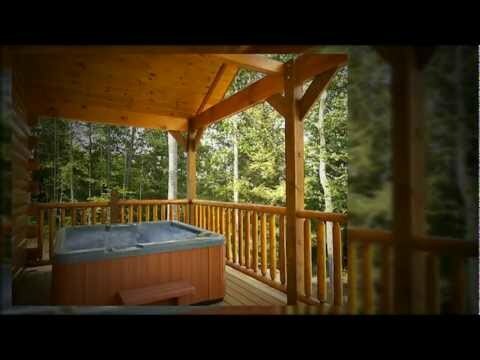 Location excellent, well-stocked, comfortable sleeping areas, NICE hot tub!